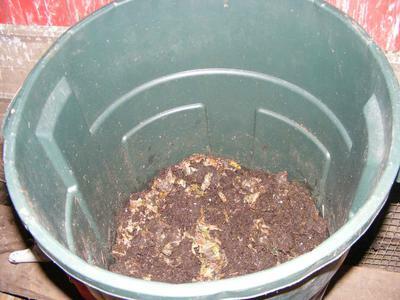 In March of 2001, I first started my worm bin in a 5 gallon bucket, but I quickly out grew the bucket in less than a month. Someone gave me a 60 gallon barrel, and I used that for almost a year. But cleaning that thing out was a challenge. I did not know anything about worms and worm farming, just that I wanted to do it. Everything I searched on line at the time, led to worm farms that did not give out information, unless you bought worms from them. I could see from my own set up I had success, even though it looked rather erratic. As I cleaned it out, I would pick out gobs of food, and the next scoop full would be a big gob of black dense heavy material, then a gob of dense heavy grassy looking compost. But as I got closer and closer to the bottom, it was all heavy dense and dark, pure worm cast. Anyway, as I learned more about bins, I found some places were selling the migration style worm bins, that started out for a hundred dollars. Right about that time a friend gave me a big pile of very thin hay twine. I couldn't refuse it, as I figured I could make something from it. 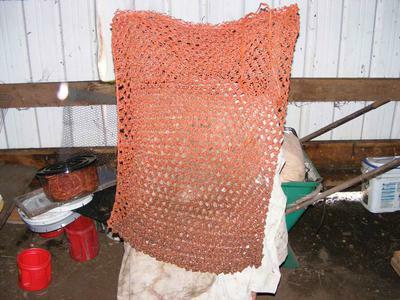 Then someone mentioned about using mesh bag to extract worms from their bins to start new bins. I thought, I could make super size bags to set up my own migration system, using garbage cans and my bags, with out having to spend a lot of money. Took a lot of time to make the bags though. But the twine was free, and I had free time. But after my bins are going for several months, I would add the bag, add some bedding material, and just continue to feed. After about a month, the bag is emptied into a new ready bin, and be put back into the old bin, and I continue to use it to collect worms until, I no longer see them. Then I clean out the bottom part, that is mostly worm cast, and remove chunks of paper and food, and sift it through 1/2 screen and store. 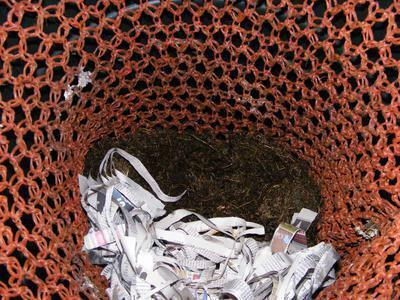 It is in the storage bins, that I fill the very small mesh bags, like the ones that come off a turkey, or a small bag of oranges, and still continue to extract worms out of the processed worm cast. But the cast can be used any time as needed. The barrels are used for the storing of worm cast, and garbage cans, and plastic storage bins are my worms bins now, easier to manage the smaller bins. 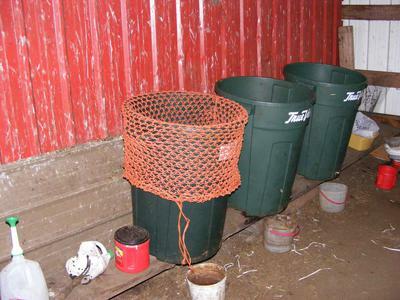 Absolutely cheap, easy, and ingenious and this would work in almost any practical-sized worm bin. I'm sure this process will change a lot of worm farmers thinking. The best practice on the inter-NET to farm in a net. I can't wait until I have enough worms to try this out on. One of my favorite things about this method, is that I can extract the worms - or at least the majority of them - from a bin with very moist bedding. The wet bins are so hard to screen to harvest worms and castings. This way, I can remove the worms, keeping them nice and moist the way they like it, and then let the castings dry out before I screen them. So Connie, you don't collect the cocoons you just allow them to hatch and collect the worms from the barrel? Thats the easy way but takes a while I suppose? Great idea with the screen. I find a window screen works just as well. The worms just move right through it. If any get hung up in it I just lay it on top of the bin with a light on and they crawl out of it. I wouldn't worry too much about the cocoons left behind. There are plenty of them where they come from. It would be undesirable to save every cocoon. Another way you may consider for harvesting is to put some kitchen scraps through the blender and pour that on top and cover. A day later remove the top layer that has worms in. The worms will be very dense in the new food. As for the egg capsules, most of them hatch out by the time the big mesh bag is ready to come out. Anything left behind, are hand picked through and later lured into smaller food filled mesh bags left in the castings, that are stored for later use. I was concerned at first about trying to retrieve all the eggs and babies, but the little babies are easy to see against the black worm cast. After visiting a big worm farm here locally, they also cannot get all of the egg capsules in their harvesting machine. The owner talked about a bag of worm cast forgotten about in a store room corner, when it was opened after a few months, it was crawling with red worms, they were skinny, but continued to thrive after being put back into their regular foody environment. The egg capsules themselves are tough and can survive cold winters and hot summers. Some areas that are dessert like, report earth worm activity after periods of drought like conditions. I live in AZ. Since the biggest rap against plastic is that it holds moisture ..DUH we have an average of 12% humidity. I use plastic totes. 18 Gallon to be exact. I feed them hydrated aged horse manure, coffee grounds and a bit of Coca Cola. The sugar gets them going and the caffeine gives them endurance. I harvest with a pan used in prospecting with a screen bottom. Mine is a 12 mesh. I don't get it all but I have 8 bins so "close" is good enough. I'll get the rest the next time. Maybe I am slow but I don't get it. I want to like these so bad...More explanation would help. Join in and write your own page! It's easy to do. How? 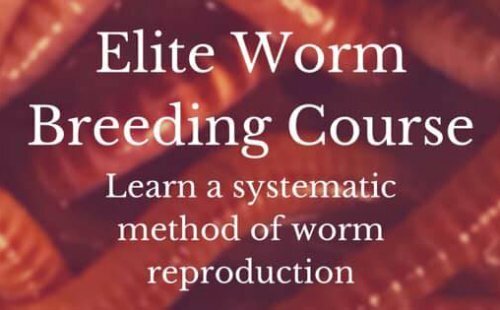 Simply click here to return to Worm Farming Systems Entries.